If you’re wondering whether to buy a corded or a cordless hand vacuum, we’ve outlined the most important factors that will determine your choice below. One of the most important factors you must consider when choosing a corded or cordless hand vacuum is the suction power of the device. More suction power translates to a greater cleaning ability, and combine it with the right type of attachment or head, it will be even better. It is not always true that you get more suction power with a corded hand vacuum, but generally, the consistently of suction power is better. This is because there is no loss of charge since the vacuum is not powered by a battery, but by the mains instead. 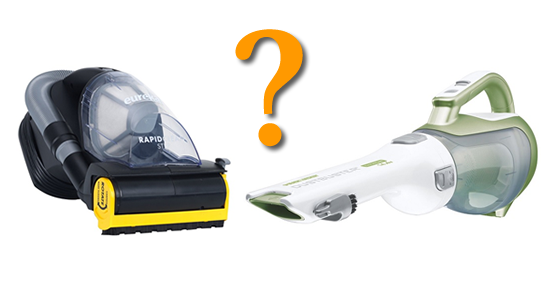 The higher the amps of a handheld vacuum does not mean it will have more suction power. Amps is only a measurement of the electrical current used by the motor. Instead, it’s the combination of airflow / suction and cleaning head. For a cordless hand vacuum, there is often a loss of suction power over the period in which the vacuum is being used, especially if the battery does not hold its charge effectively. Bear in mind that a stronger suction will also limit the running time. In this case, it’s more advisable to choose a model that uses a high voltage Lithium Ion battery since they can hold a charge better than their counterparts, which means that they will give a longer and more consistent suction power performance. 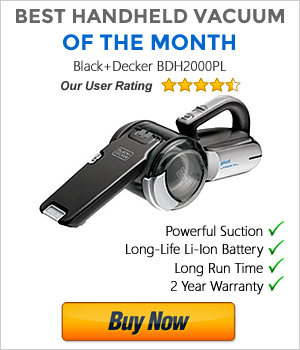 The Black & Decker Platinum BDH2000L is a prime example of a cordless handheld vacuum that has utilized its battery capabilities to sustain a consistent powerful performance. Charging and running times are two things you need not worry about if you were to buy a corded hand vacuum. The charge and run times are two major determining factors for consumers when choosing a cordless hand vacuum. They directly relate to power since a poor battery usually means poor performance. Again, a Lithium Ion battery is recommended since they generally charge faster, run for longer at a more consistent rate, and won’t lose its memory life when you leave them on charge in between uses. It’s too much hassle dragging a big heavy vacuum around your home anytime you want to clean certain areas. It’s a good reason to buy a handheld vacuum. But although both corded and cordless are portable, a cordless provides more flexibility. You will be somewhat limited to where you can take a corded handheld vacuum. You always need to find a close-by mains socket, which can be a bit of a hassle if you plan on cleaning your car interior. Fortunately, most decent corded hand vacuums have long power cords (usually between 16-20 feet) to makes things a bit easier. However, the Eureka RapidClean 41A has a very long 25 foot cord. There’s no place that you cannot take a cordless hand vacuum. If you want to clean your car, your office or the loft, you can do so pretty easily. Just be sure to have it charged up and ready to go. Another advantage is that there’s one less wire in your home, so if you have kids or the elderly around, you won’t have to worry about them tripping over. You’ll find that on average, corded hand vacuums are cheaper than cordless models. A decent corded hand vacuum would range between $30 – $40, and it will likely provide a similar or better performance than a more expensive cordless model. If you want the benefit of convenience and transportability, then you simply have to pay more. A decent cordless hand vacuum can cost up to hundreds of dollars, but the price range is so wide that you can pick up a good model for around $50. However, if you’re expecting something that’s head and shoulders above the majority, be prepared to pay up to $120. There are less things that can go wrong with corded hand vacuums which is why usually only 1 year warranty is provided. By using a battery as the only source of power, this can lead to additional problems. It must be stressed that it’s important to buy a cordless vacuum with a superior battery, preferably one that’s removable, because when the battery comes to the end of its life and it cannot be removed, then it renders the entire vacuum useless. However, many Lithium Ion batteries have a long lasting life span. Many manufacturers of cordless hand vacuums provide 2 or 3 years warranty should any issues arise within that time frame. This gives consumers a bit more peace of mind. There really is no debate about which is better between corded and cordless hand vacuums, but it’s rather a question of which one is more suitable for your needs. If convenience and transportability is a priority for you, then go for a cordless hand vacuum, but if price and longer cleaning time is more important, then choose a corded model. You may want to read our Top 5 Corded Handheld Vacuums or the Top 5 Cordless Handheld Vacuums, to see what the best handheld vacuums are in their fields.